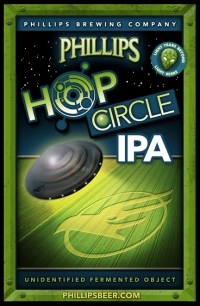 More robust than Finagle’s Folly and twice as mighty as Pan-Galactic Gargle Blasters, Phillips new Hop Circle IPA is out of this world. We’re boldly going where no local IPA has gone before and we want you to come along. You don’t need a space helmet or intergalactic vaccinations, just a thirst for the most refreshing IPA this side of Rigel VII. Hop Circle will be officially launched this Tuesday, April 20th at 4:20 PM with a release party at the brewery. Attendees are encouraged to “come dressed in your most interstellar space getup”, with prizes to be awards for the best costumes. Phillips definitely release some exciting beers in their seasonal lineup. But it can be hit and miss, but at least they are trying harder than most who still produce honey lagers. I always buy the seasonal releases, and look forward to trying this one. You can make all the new beers you like Mr Phillips. I respect your originality. By why, for the love of god, take away the IPA? Please bring back original label , this one is terrible.